The Online Clinic is prepared to prescribe Dymista allergy relief nasal spray online if you suffer from allergic rhinitis as part of your hay fever symptoms. 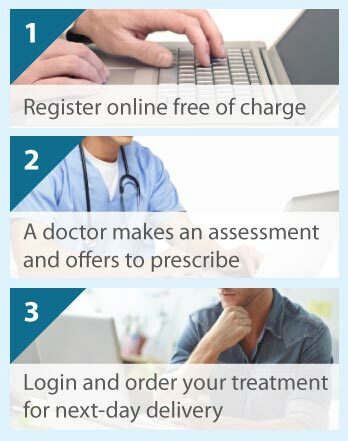 Simply complete a quick online consultation form, which will be reviewed by one of our doctors and then proceed with a purchase for next day delivery of medication. The consultation is free and without obligation. Dymista is a nasal spray that contains two different medicines that are effective at relieving the symptoms of moderate or severe hayfever. One of the constituents is an antihistamine drug called azelastine. This has a long acting effect which is able to prevent the production and release of the chemicals that are triggered by pollen allergy. It is these chemicals that are responsible for the symptoms of hayfever. The other active constituent fluticasone, acts by reducing the swelling and soreness in eyes and nasal membranes that occur as part of the allergic response. The fact that both constituents work in different ways means that Dymista is likely to be more effective than medicines containing either of the drugs alone. In most cases it relieves nasal symptoms within 15 minutes of taking each dose. Dymista is supplied as a nasal spray. The bottle should be shaken gently for a few seconds before use. The first time you use Dymista you will need to prime the pump by pressing and releasing it until a fine spray appears. Before using the spray you should blow your nose. Then spray the liquid once into each nostril keeping the head tilted downward. After use, wipe the spray tip and replace the protective cap. Take care to avoid spraying the solution into your eyes. It is usually recommended that you apply the spray twice a day, once in the morning and once each evening. The spray can be used in the long term as needed to counteract the effect of the pollens that affect you. Your doctor will advise you about this. If you have not used the spray for 7 days you will need to re-prime the pump device by pressing and releasing it once prior to use. If you complete a consultation form we will be able to see if Dymista is appropriate for you. You will not be able to use Dymista if you have a known allergy to fluticasone or azelastine, if you are taking antiviral drugs for HIV, or if you are being treated for a fungal or bacterial infection. Make sure you let us know if you have a nasal infection, or have recently had nasal surgery. We will also need to ask if you have had tuberculosis, if you have any current untreated infection or if you have glaucoma. Nose bleeds occur in more than 10% of people using Dymista. Headache is another fairly common side effect. Some people complain of a bitter taste in the mouth, but this goes away if you have a soft drink a few minutes after applying the spray. Dymista may also affect your sense of smell. You should stop using Dymista if you develop swelling of the face, tongue or throat, or if you experience visual loss or red and painful eyes. In either case contact us immediately if we have prescribed for you. The vast majority of people taking Dymista have no side effects whatsoever. Take a free consultation to get started.